At the request of RhinoForYou, I've been prototyping an IFC import to VisualARQ using their recently released Grasshopper Components (and of course the Geometry Gym GH components). I know Asuni are working on adding more components including to generate styles (until then, the user must manually create and assign in Grasshopper) but the evidence of Grasshopper being a fantastic environment for interop is again evident. The grasshopper definition used (update to latest version of IFC plugin and you need VisualARQ components) can be downloaded here. I'm seeking permission to post the IFC file in this demonstration. 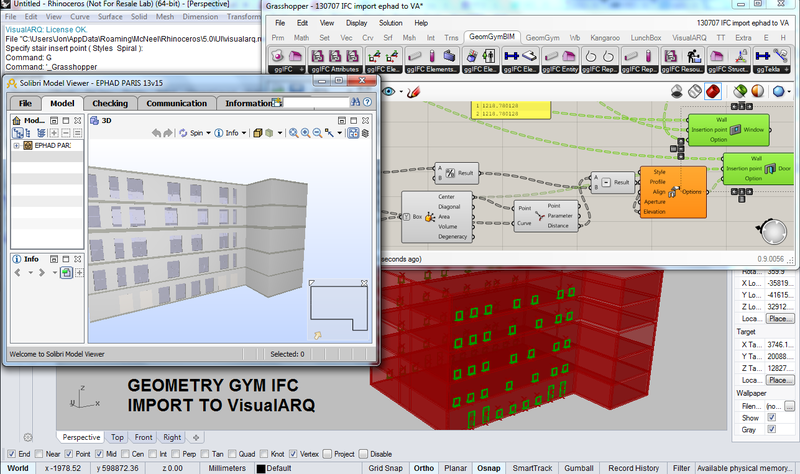 I'm working on adding beams, columns and other objects that can be created in GH by VisualARQ. Don't hesitate to get in contact if you have suggestions, requests or observations.